Aspects such as the neck relief (bend), neck tilt, nut height and angles, bridge saddle height and angles, intonation (fine tuning) and fret levelling can be adjusted to bring out the best response from your instrument. In many instances, the action (string height) can be far too high even on brand new instruments and it makes the guitar difficult to press down the strings. This is harder for beginners of course. A set up is a relatively inexpensive way to bring the best out your instrument. I have a Fender Deluxe Stratocaster that has been set up a number of times in the 12 years I've had it. Each time it is done, the guitar feels and sounds so much better. It generally gets 'out of whack' in a very gradual way and we don't always realise it is happening and then all of a sudden it sounds bad and won't play in tune and may buzz or rattle. You would need to find a good guitar technician who can bring it back to life. It will cost a little but is always worthwhile. I use Pete Walcott at www.walcottguitars.com.au. He lives close by and I trust him with my many instruments. Ask around your area and seek the advice of experienced guitarists. The Circle of 4ths contains a huge amount of information when we understand it in some depth. 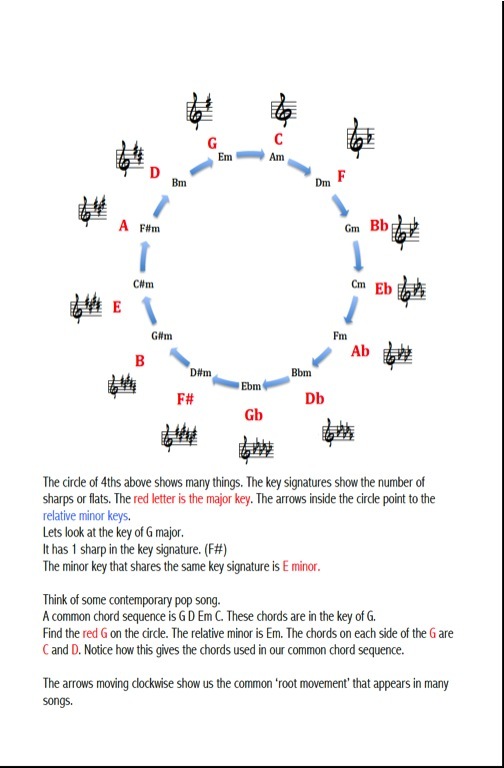 A songwriter may know nothing about the circle of 4ths but use it all the time in their songs. It is particularly useful in performance, composition, playing by ear, improvisation, arranging teaching and general understanding of music. As a general suggestion, allow a few beats for your guitarists to go from chordal playing to single notes and vice-versa. This would be a challenge. Usually it is best to allow your guitar players time to transition from the larger strumming action to the smaller and more precise picking action. Arranging for guitar is a very complex and involved subject, so we will handle it in small chunks. Here are some basic 'rules'. These are generalisation but are usually applicable to most high school aged guitarists. There are, of course, exceptions. The guitar sounds an octave LOWER than it is written. Cluster chords of 2nds may be unplayable. Why Electronic Tuners Are Not the Complete Answer. When I first started work in a music shop, one of my jobs was to tune each guitar every day. This was before electronic tuners were just starting to become available. Now, of course, people just clip on a tuner and away they go.